The Lawyer recently published an article highlighting some of the biggest City law firms’ lack of effort in combatting workplace harassment and bullying. In the article, these large firms are criticised for only doing the minimum, if that, to ensure workplace harassment does not go unnoticed and unidentified. When faced by The Lawyer with the question of how many people have been dismissed for inappropriate behaviour in the past year, many firms avoided answering the question. Law firms are required to report misconduct, an issue so important that the SRA is currently consulting on it. The fact that so many firms evaded the question altogether shows just how little some firms are willing to do to improve their attitude towards workplace harassment. It is important that staff feel they can report any inappropriate behaviour they either experience or see and have it dealt with appropriately. Research shows that harassment is still not being reported because staff either do not feel any action will be taken, or they feel making a report could negatively affect their role. For example, a survey by the International Bar Association found that over half of women barristers experienced bullying or sexual harassment but most did not report it for fear of repercussions. Among a barrage of naming and shaming that highlighted firms still have a long way to go to improve their culture, Pinsent Masons stood out as a law firm that is taking clear steps to improve. They did not dismiss any UK employee for inappropriate behaviour, but did dismiss a UK contractor and an employee in an overseas office for failing to meet the accepted level of behaviour – and voluntarily disclosed this to The Lawyer. Pinsent Masons’ full response, which included five steps they are taking, was included in the article. One of the key steps they took is to roll out new diversity training which includes a module on anti-harassment which they have developed with VinciWorks. VinciWorks’ customised MyStory: Harassment and Bullying at Work for Pinsent Masons requirements. 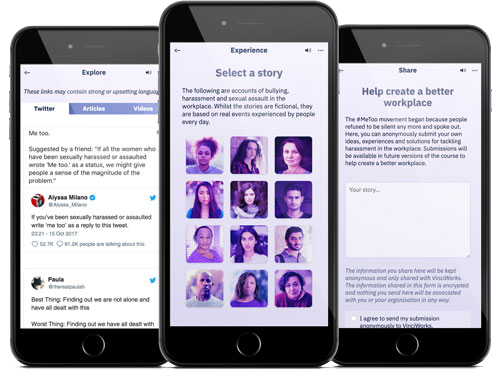 The original course, which was shortlisted for the Learning Technology Awards 2018, was inspired by #MeToo and brings to life the real impact of bullying and harassment at work through hard-hitting stories. In addition to the course VinciWorks offers a harassment whistleblowing portal, where staff can anonymously report any inappropriate behaviour they have either seen or experienced for themselves. The training, together with the whistleblowing portal, can help firms create a culture whereby all staff feel they have an important role in preventing any form of harassment and bullying in their workplace. This entry was posted in Harassment, Thought leadership on 17th January 2019 by VinciWorks.